Click Here to see full size map!!! Only a 30 Minute Drive From The Airport!!! Click images to see full screen view!!! 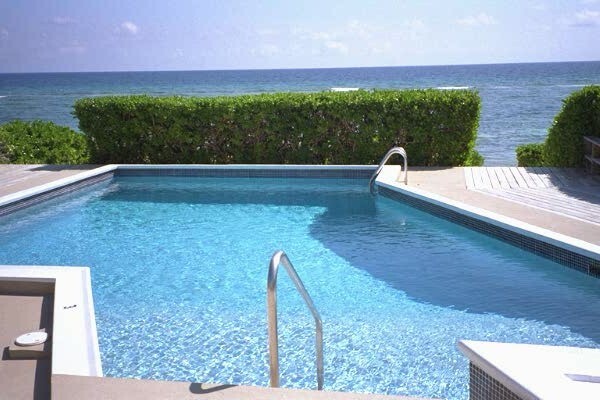 Located on the quiet, unspoiled side of Grand Cayman, our condo sits in a quaint, white sandy beach front 10 unit complex and is the only unit in the rental pool that has a vivid blue ocean view from every window. (even the bathroom has a view of the sea.) Some guests have likened their stay to staying on an ocean liner…..there is pristine blue ocean surrounding them from every window, and some have even said they momentarily felt like they were actually floating on the water. (we are that close to the water) Both of the two bedrooms plus the vaulted living room open into a panoramic screened - in lanai that overlooks the white sand beach with it’s aqua blue water and the newly refinished freshwater adult and children’s pools. This 120 degree awe inspiring view is unsurpassed …. And even if you do nothing but relax on the porch for your entire vacation… you will go away satisfied that you have visited paradise. Of course, the Caymans are known for it’s fabulous barrier reef dive sites, and it’s many other safe family activities. There is plenty to do, and plenty not to do, depending on your preference. The North Side of the Island is famous for its excellent diving and is especially attractive to those who like to experience the sea in it’s uncluttered, natural beauty…without the cruse ship crowds. The North side hosts a magnificent "Wall" dive that is only 300 feet from our complex and fish life is abundant and excisable for those who enjoy snorkeling. Stingray City where visitors pet and feed stingrays in their natural habitat of a waist deep sand bar is close by. The famous Rum Pointe Beach is only a few short minutes away, and is a gentle, crystal clear beach that offers many water sports as well as a tropical beach bar and restaurant. Many first class restaurants are located near by, as well as a ferryboat that can shuttle you over to the busier 7-Mile beach area if you prefer to kick back and not take the scenic drive. But most who visit the North Side find that their tours of the other sides of the Island lead them quickly back to the flavor of the old style hospitality of the North Side of Grand Cayman Island. There, paradise is found. We think you will agree. Compare what we are offering with other accommodations. Always be sure to ask for current pictures of any unit you are considering because there are many condos in the Caymans that have not been kept up. Don’t be disappointed and spend your vacation in a home where you and your family are not comfortable. Compare and we are sure you will want to stay with us. Our condo is our second home, and when we invite guests into our home, like you, we want to cater to their comfort and enjoyment. It is our promise. If you have any questions about our condo, please be sure to Email us at gtr@blissnet.com or telephone 1-307-733-1609. You won’t be disappointed. …… and you could have the best vacation stay of your life. Many of our previous renters will agree, and it is where we spend every free moment we can also. We love it there and you will too!!!!! !